Arches National Park is located in the western U.S, just a few miles north of one of the eco-tourism capitals of the world, Moab, Utah. This region of eastern Utah is a popular outdoor recreation area known for its hiking, backpacking, world-class mountain biking and adventures for 4-x-4 off-road enthusiasts. Arches also is home to over 2,000 natural sandstone arches with the highest concentration of natural arches in the world including Delicate Arch, one of the iconic state symbols of Utah. In 1929, President Herbert Hoover granted the region protection and created Arches National Monument. Delicate Arch was not included in the initial land grant until 1938 after an expansion of the Monument declared by President Franklin D. Roosevelt. In 1940, a Civilian Conservation Corps (CCC) Camp was established to improve access, drainage and build a headquarters building. The camp was closed in 1942 when the U.S. entered World War II. Just before President Lyndon B. Johnson left office in 1969 he signed a proclamation “substantially enlarging Arches National Monument.” Just two years later, President Richard Nixon signed legislation enacted by Congress in 1971 reducing the size and changing the monument to a national park status. 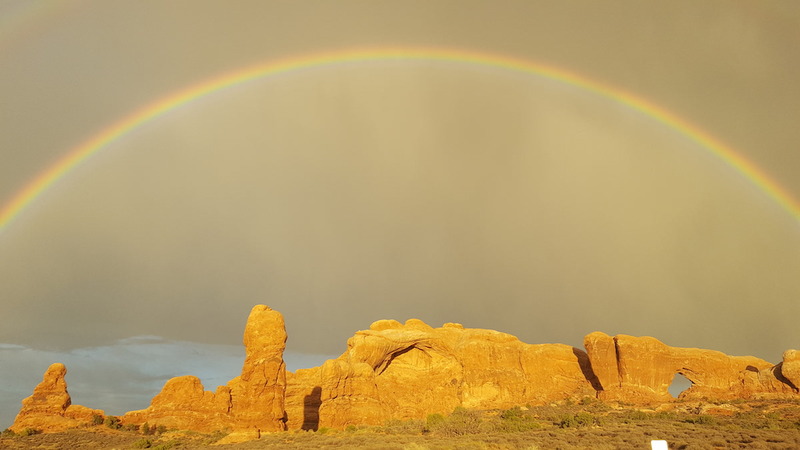 Over the years, visitors to Arches have increased each year to over 1 million visitors per year (610,000 AADT), far exceeding the original design capacity of the park’s infrastructure of 75,000 AADT per year. Because of this, infrastructure at the park, among many other challenges, was taxed beyond its capability. In 2011, park and Federal Highways officials began evaluating road conditions with anticipated increases in visitation impacts in mind. Several treatment methods were looked at, including chip seals, slurry seals, thin overlays, mill-and-fills with 2.5 in. of new asphalt and heavy rehabilitation including cold in-place recycling (CIR). An analysis of road conditions resulted in plans for a major road construction project and the decision to use CIR was made. The Resurfacing, Restoration and Rehabilitating (3R) project was funded with Federal Highways gas taxes. Bid letting took place on Jan. 4, 2017, and Kilgore Cos. LLC, dba LeGrand Johnson Construction Co., was awarded the contract. Cost came in at $14,522,660. Team assembly soon followed: Joe Wilson with the Federal Highway Administration was the contracting officer with Jim Futch as project engineer; John Lewis, chief of maintenance, headed up the Park Engineering Department; and Area Manager Ryan Holyoak, along with Project Supervisor Warren Stewart and Project Manager Jeff Foster, represented LeGrand Johnson. Crews performed most work overnight to keep access to the park going during daylight hours. The road into the park is just off U.S. 191, and is essentially a dead-end with most of the roadway only 21 ft wide. From the park entrance the road is steep, with several switchbacks climbing to the top of the mesa where it goes north for 23 miles of breathtaking scenery that includes small loops, turnouts and shorter spur roads to scenic vistas and arches. With the safety of park visitors in mind, and because there are limited turn-outs for parking and very few places to stage equipment, the park decided to close from 7 p.m. to 7 a.m. each day in order to perform work during the night hours. Additionally, no construction work was allowed during weekends and holidays. The scope of the application consisted of drainage improvements, grading and widening, pulverizing, rehabilitating 3 in. of the existing asphalt section with CIR and overlaying with 3 in. of new asphalt in two equal 1.5-in. lifts. Western Emulsions submitted the mix design and job mix formula. To best meet the unique settings and constrictions on the job, Western outlined and recommended quantities for emulsion at 2.5% and a portland cement content of .5% to achieve the desired end results of the job as required by the owner. The job mix formula called for 100% passing on a 1.5-in. sieve test. In the end, 1,340 tons of Western’s PASS R emulsion and 268 tons of portland cement supplied by Ashgrove Cement were used to formulate and properly build the CIR. The job particularly called for portland cement over lime because an accelerated cure time was needed for the recycled mat to allow a faster return to traffic for park visitors. Coughlin Co., working as a subcontractor based in St. George, Utah, did the CIR portion of the job. Over the past 10 years, Coughlin has recycled almost 2,000 lane-miles and is known throughout the west as a very experienced and productive company with a focus on recycling. For CIR applications, Coughlin typically uses a Roadtec RX 900 cold planer to tow a Roadtec RT 500 recycling train with screening, crushing and mixing capabilities (100% closed circuit). As part of the train, emulsion is transferred from a supply tanker to the RT 500, where it is metered into a pug mill and mixed with millings from the RX 900 cold planer. Portland cement is introduced and metered from a spreader hopper into the cutting drum of the cold planer, where water is injected to activate the cement. Once started, this is a continuous process with production averaging over 2 lane-miles per day. With limited space to park and stage equipment, the CIR crew worked and planned with great detail to prepare the train prior to each shift. By the time the park was ready to close for the night, no time was wasted moving the equipment in place to start the shift. With the cold planer hooked up to the RT 500 recycler, transfer hoses and power cords secured, the RX 900 was set to the specified milling depth prior to each shift. As the process got underway each night every component was closely watched. At the end of the shift, the work was not complete until all equipment was cleaned, prepped and made ready for the next day. Directly behind the recycling train, the crew for LeGrand Johnson used conventional paving equipment for laydown and compaction. This included a Cat 1055D paver with a Weiler pickup machine to transfer the recycled asphalt windrow into the paver. Three compacters were used to reach the desired densities. A rolling pattern was established consisting of two CB 64 rollers, 100-200 ft behind the paver, with ¼ overlapping pattern and a minimum of two passes on the entire mat. 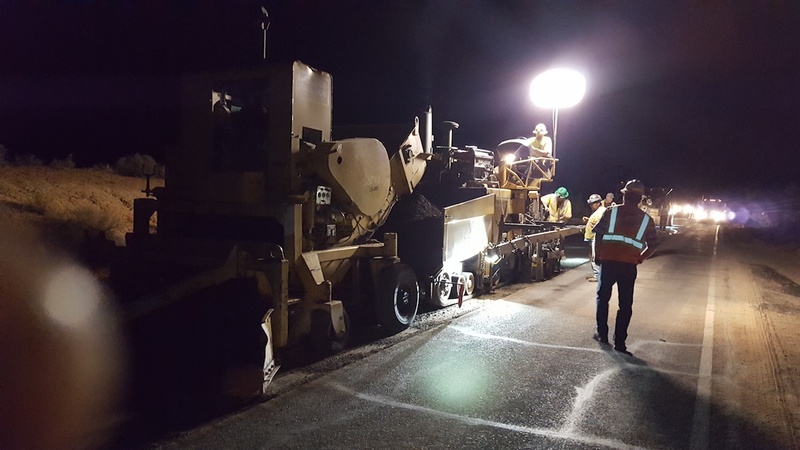 A 25-ton pneumatic roller was used to accomplish the finishing and final compaction. A 3-in. layer consisting of 53,600 tons of existing asphalt and 47 lane-miles were recycled and overlaid with 3 in. of new hot-mix asphalt (HMA) placed at the end of the project. The mix design for the new HMA included a ¾-in. nominal max size aggregate using 75 gyration and 15% RAP. The asphalt binder was a PG 76-22 supplied by Peak Asphalt out of Woods Cross, Utah. The overall design was 6% total binder by weight. Arches is one of the most popular national parks in the U.S., with more than 1 million visitors each year. Utah is the home of the “Big Five” national parks in the U.S. with Zion, Bryce Canyon, Capital Reef, Canyonlands and Arches compromising some of the most spectacular and stunning views found anywhere in the world. In 2017, visitors to Zion National Park surpassed Yellowstone by close to 50,000 people. Similar to the challenges faced by Arches National Park, such increases will continue to impact the infrastructure at Zion National Park as well as many of the other treasures found in our national park system. Limited funding, increase in visitations, and the need to find meaningful, low-impact solutions are a challenge for any asset manager. The challenges and opportunities faced by our national parks are no different. By being proactive, focusing on quality HMA and processes such as CIR, managers and owners alike have the tools available to them to help meet those challenges—as they did in Arches, which was completed this past December. Ryan is with the Utah Asphalt Pavement Association.